Is a lie, including this. 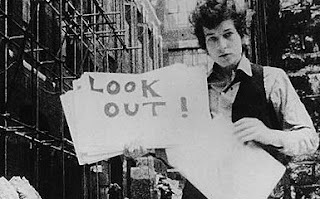 "It's Alright, Ma (I'm Only Bleeding)" is the song that precedes "It's All Over Now Baby Blue," the closer on the 1965 album "Bringing It All Back Home." The song is seven and a half minutes of electrifying bile and scorn heaped upon the entire world. I used to think that as I grew older, I would begin to find the aggression and the hatred of "the way things are" growing to sound immature. I was wrong. The song has become sharper over the years, and I think how precocious a 24-year-old person would have to be to choose where to direct rage. Dylan radiates in all directions on this song, but he hits each target right at the center. The message is that life is a lie, that we're aiming for the wrong ends, we've been conned, and in fact we've conned ourselves and been a party to our own futility. But, as he says at the end of every verse, it's all right. 1. "There is no sense in trying." 2. "He not busy being born is busy dying." 3. "Watch waterfalls of pity roar, You feel to moan, but unlike before, You discover that you'd just be one more person crying." 4. Kill what's crawling, or "don't hate nothing at all except hatred." 5. "It's easy to see without looking too far that not much is really sacred." 6. "But even the president of the United States sometimes must have to stand naked." 7. "Advertising signs they con you into thinking you're the one that can win what's never been won, Meantime life outside goes on all around you." 8. "Alone you stand with nobody near when a trembling distant voice unclear startles your sleeping ears to hear that somebody thinks they really found you." 9. "(to) not forget that it is not he or she or them or it that you belong to." 10. "For them that must obey authority that they do not respect in any degree, Who despise their jobs, their destinies, speak jealously of them that are free, cultivate their flowers to be nothing more than something they invest in." 11. "While one who sings with his tongue on fire, gargles in the rat race choir, bent out of shape from society's pliers, cares not to come up any higher, but rather get you down in the whole that he's in." 12. "Money doesn't talk it swears obscenity, who really cares, propaganda, all is phony." 13. "It blows their minds most bitterly for them that think death's honesty won't fall upon them naturally, life sometimes must get lonely." Only a hint of self pity appears at the end, though it's an ironic ending, given all the honest thoughts he's just shared: "And if my thought-dreams could be seen, they’d probably put my head in a guillotine." Hello Robert, yes another interesting analysis of a song from Bob Dylan's Music Box http://thebobdylanproject.com/Song/id/320/Its-Alright-Ma-Im-Only-Bleeding Follow us inside and listen to every song composed, recorded or performed by Bob Dylan, plus all the great covers streaming on YouTube, Spotify, Deezer or SoundCloud.